Gerard Moes, a relative of Mother Alfred Moes, recently visited Rochester with his wife, Margit, to get a closer look at the medical institution his great aunt helped to create. Last month, Mayo Clinic hosted a pair of distinguished visitors: Gerard and Margit Moes. The couple traveled from their home in Luxembourg to Rochester, Minnesota, to see and learn more about the place Gerard's great aunt, Mother Alfred Moes, famously helped to create back in the late 1800s. Their tour included stops at the Saint Marys Campus of Mayo Clinic Hospital – Rochester, Assisi Heights and the gravesite of Mother Alfred Moes. 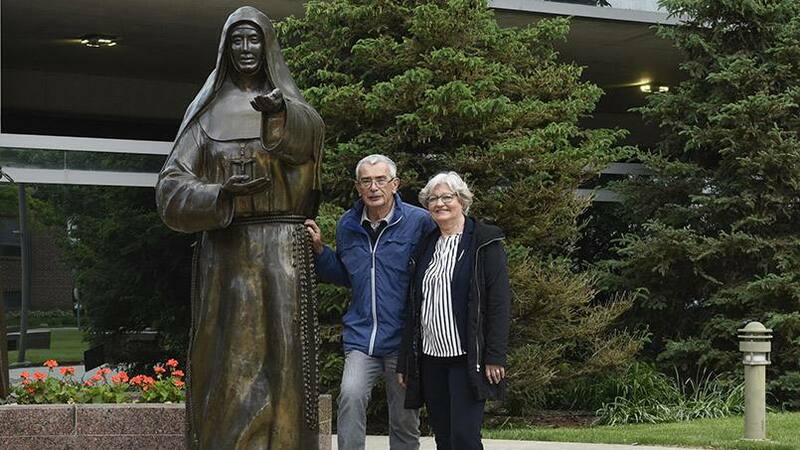 The visit, which was reported by the Rochester Post-Bulletin and Rochester's ABC 6 News, came about after staff working on the Mayo Clinic Heritage Days film, "Healing Hands: The Sisters of St. Francis and Mayo Clinic," reached out to Gerard and Margit while conducting research. An invitation to visit Rochester and Mayo Clinic was extended, and promptly accepted. During their visit, Gerard and Margit were able to see and experience firsthand the impact Mother Alfred Moes had on Rochester. It was Mother Alfred, after all, who convinced Dr. William Worrall Mayo and his sons to staff the hospital that she and the Sisters of Saint Francis congregation she founded would build. Their first stop was Assisi Heights, where the Sisters of Saint Francis continue to serve and live. "What I like of Assisi Heights is that there seems to be … this silence, this harmony," Gerard tells the Post-Bulletin. "Everybody has a contribution." When Mother Alfred left her hometown of Remich, Luxembourg, with her sister, Sister Barbara Moes, that's exactly what they set out to do: make a meaningful contribution to their newly adopted home country. Rumor has it one of those contributions occurred in Chicago during the great fire of 1871, when Mother Alfred personally delivered barrels of water via horse and buggy to help fight the fire. And 12 years later, her "stubbornness" and persistence convinced Dr. Mayo to agree to serving as director of the new hospital she wanted to build in the wake of the great Rochester tornado of 1883. "Her persistence changed his 'no' to a 'yes,'" Gerard says. And the rest is, well, you know. "For her to have helped establish the world's greatest medical center is beyond belief, beyond Imagination," Gerard says. Especially in a city that we're told Mother Alfred once famously referred to as being approximately "50 miles from nowhere." As Gerard and Margit continued their tour of Mayo Clinic and Rochester, Gerard said he knew they weren't alone. "As I walk these halls, I feel her presence and the presence of W.W. Mayo," he said. "Their spirit lives on in all of your faces. In all of your smiles." If Mother Alfred were here to see all the ways Mayo Clinic and Saint Marys Hospital have changed through the years, Gerard says he knows she wouldn't be the least bit surprised or amazed. Instead, he says, "She would be grateful." As Gerard and Margit finished their visit, Gerard said, "As we leave this place, we leave the good wishes (and prayers) of the Moes family. Our wish is that the tenacity of Mother Alfred is used today to care for the sickest of the sick. We owe her that." Leave a legacy by sharing your comments below. You can use the handy social media tools atop this page to share this story with others. My great grandfather Nicholas Moes came from Luxembourg – he was born in 1825. I am wondering if Mother Alfred Moes is a relative. Many of our relatives live in South Dakota.